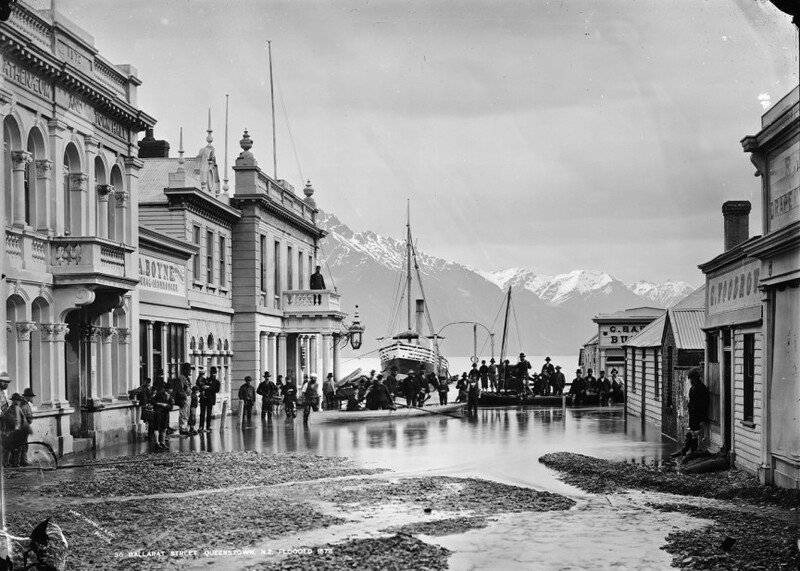 This picture by William P. Hart shows the flooded Ballarat Street in Queenstown, New Zealand, during the Central Otago floods of September and October 1878. The rivers rose rapidly and Lake Wakatipu spilled into the town. For Queenstown, this is the most significant flood event on record, apart from the 1999 flooding. A ship can be seen on the lake at the end of the then-flooded street. The scene gives the impression that Queenstown's thoroughfares have become navigable waterways. Men have gathered to be in the photograph, which was still a rather new and exceptional medium in the 1870s. Their poses reveal the long relationship between artistic arrangement and documentary photography.